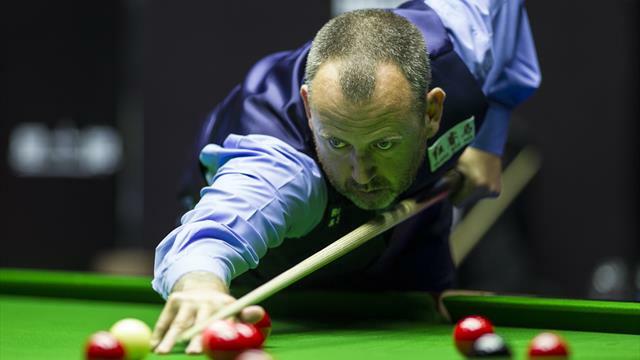 Mark Williams and Neil Robertson both exited the World Grand Prix at the first-round stage after losing their deciding frames on Wednesday. World champion Williams succumbed to a superb performance from 18-year-old Yuan Sijun, who won 4-3. Williams scored 138 in frame four before taking a 3-2 lead, but Sijun responded brilliantly with a break of 131 before winning the decider 76-0. Sijun will face Stephen Maguire in the next round after he Mark King 4-1. Meanwhile, Robertson lost 4-3 to Xiao Guodong after throwing away a 3-1 lead. Breaks of 59, 80 and 62 moved Robertson within one frame of the second round, but Guodong won three in a row – including a sixth-frame 106 – to beat the 2010 world champion. Guodong’s reward for beating Roberson is an encounter against Mark Davis, who held his nerve in another deciding frame against Jimmy Robertson. Davis’ victory ensured all of the matches on Wednesday afternoon went the distance, as earlier Ali Carter prevailed against Martin O’Donnell after winning the final two frames. Carter takes on Mark Allen in the second round. In the evening session, Judd Trump let a three-frame lead - built on the back of runs of 92 and 122 - slip against Stuart Carrington but prevailed in the decider to secure his place in the last 16. Elsewhere, a Ding Junhui masterclass saw the world number nine through to the next round after he beat Jack Lisowski 4-1. Having lost the first frame, the 31-year-old rallied to take the next four with breaks of 52, 88 and 126 - such was his excellence, he won the last three frames courtesy of 349 unanswered points. In Tuesday’s other late match, Tom Ford knocked out world number 18 Joe Perry, winning 4-3 on another last-frame decider and will next face Trump for a place in the quarter-finals.